November | 2008 | Wiffle Lever To Full! Anyone Want A Signed Wiffle Lever For Christmas? I had a strange experience last week… I was tidying up in the spare room when I found myself peering inside the old wardrobe that I inherited from my beloved old Uncle Homebase back in 2001. Leaving the door slightly ajar (because I know that it is a very silly thing to shut oneself into a wardrobe), I kept pushing through an endless wealth of Top Man jumpers smelling of mothballs and then – strangely – felt the brushing of fir trees against my face and the crunch of snow underfoot! Yes, bloody typical… I only wanted to find room to keep my overspilling Star Wars Weekly collection, but there I was back in Narnia again. But wait! What was that I could see in the distance…?!?!?! 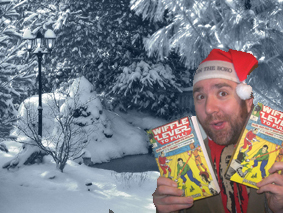 Why, a spare box of pristine copies of ‘Wiffle Lever To Full!’ left stranded out in the snow! Alright, enough of this nonsense… would anyone like a signed copy of ‘Wiffle Lever To Full!’? They make ideal Christmas presents for the sci-fi and fantasy-loving friend or relation, and I’ll gladly dedicate them to anyone you like, and I even do rubbish little cartoons of anything you want on them. I reckon I can knock these out of my Narnia lock-up for £10 including postage and packing, so if you’d like one feel free to drop me a message (or reply here) and I’ll happily sort it out with you. The meandering highways of our lives are dotted with milestones by which we mark out the passage of time. Birthdays, Christmases, births, deaths and weddings. Doctor Who fans have an extra one, though. We mark our lives by the Doctor’s regenerations. And, of course, there’s another one on the horizon. Back in the dim and distant murkiness of my childhood, I can only vaguely remember being aware that Tom Baker wasn’t the first Doctor to have whizzed around in the TARDIS. I think my Dad had made the odd cryptic comment about somebody called ‘William Hartnell’ and my Uncle Trevor had definitely mentioned that it was ‘better when Jon Pertwee was the Doctor’ (he was at a difficult age). But, as far as I was concerned, they might as well have been talking about Lady Hamilton and Lord Baden-Powell. Kids don’t really DO the past, so Tom was the only Doctor I cared about. 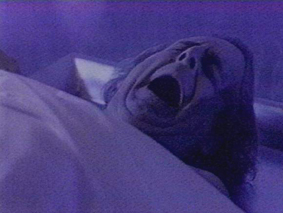 Anyone who’s read ‘Wiffle Lever To Full!’ will know how much of an impact Tom Baker’s regeneration made on me. Even when I wrote the book, I didn’t need to look up the date – Saturday 21st March, 1981. I was eight, and I was round at my Gran’s house in Acklam, eating something luminous undoubtedly manufactured by Findus or Bird’s Eye and looking forward to a slice of the brilliant chocolate-coated Flake Cake that my Gran brought home every weekend in a soggy white cardboard box from Shipman’s the Bakers. It had been a normal Saturday – I’d slumped in front of Swap Shop in my pyjamas and eaten some toast coated in radioactive red jam, then me and my Mum and my Gran had caught the No. 13 bus to All Saint’s Church in Middlesbrough, and I’d bought a Star Wars figure from Romer Parrish’s and a nice new writing book from WH Smith’s. Then I’d come back and started writing a new story after a bit of beans on toast, and I probably called for Lisa Wheeldon and did a few laps of the block on my glistening Christmas Raleigh Striker. 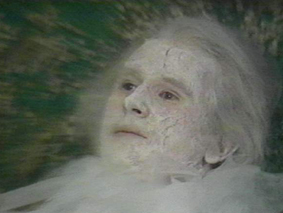 …’Ooooh!’ said my Mum, as a fresh-faced Peter Davison sat bolt upright in Tom Baker’s clothes at the end of the episode. 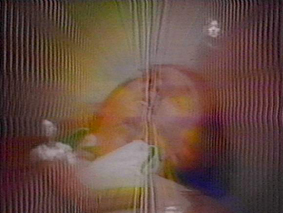 ‘There you go, a new Doctor Who…’ Big slabs of confusion, exhilaration and – worryingly – grief collided like icebergs in the tiny Bering Straits of my mind, and from that day on I was (capital letters) A Doctor Who Fan. …and this time it was MINE. Ah yeah, everyone at school saw it as well, but they didn’t understand it like I did. They didn’t know the minutae of the regenerative process, and its effect on the delicate balance of the space-time continuum. Or something. 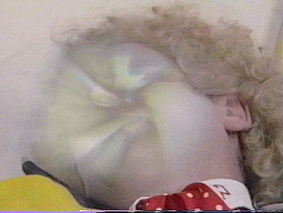 And when Colin Baker sat up with a quiver of his upper lip and was unspeakably rude and flippant to his companion Peri Brown, I felt that the programme had truly grown up. 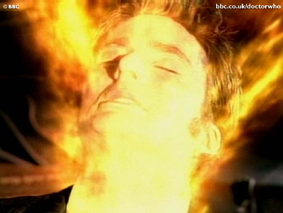 Yes, Christopher Eccleston’s regeneration into David Tennant. We watched it at 1am when we got home, with the tall Cornish Sorcha resting her head on my chest and uttering – at the point of the changeover – uttering the immortal words ‘Are you alright? I’ve never known anyone’s heart beat so fast’. I think she was a little scared that I was about to regenerate myself, although possibly quite hopeful that I’d end up looking a bit like David Tennant. So, in the words of Brigadier Lethbridge-Stewart back in 1974, ‘here we go again’. The next regeneration looks set to take place sometime around Christmas 2010, before which we’ll have endless speculation about the identity of the actor who’ll emerge on the other side of it looking slightly confused and wearing David Tennant’s clothes. Shipman’s the Bakery is no more, but I’ll see if I can find a chocolate-coated Flake Cake in a soggy white cardboard box to mark another milestone. I’ve been rumbled by the Discworld lot! Hello to the charming bunch at the Cunning Artificer forum, who seem to have recently discovered Wiffle Lever and been very nice about it so far. This includes the lovely Kris, who kindly talked Sorcha and me through an eight-hour real ale session while standing at a pub table with the head of Thieves’ Guild. Hello! I’ve also discovered, slightly worryingly, that the scary, beardy, barbarian standing on a double yellow line in the colour picture section has seen the picture himself. Apparently he’s called Butcher, and I’m desperately hoping it’s because he runs a friendly little village meat shop. 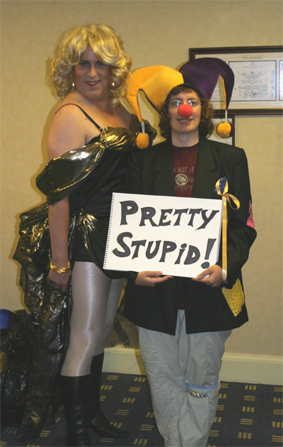 The Discworld Convention was kind of my dark night of the soul – it was amazing, and everyone was lovely, but it came after a back-breaking run of convention weekends and I was absolutely exhausted by the time I got there, and barely capable of speech and movement by the time I left. So I spent a bit of it being quite grumpy, which is very unlike me. Looking back, the main cause of my grumpiness seemed to be the proliferation of Iron Maiden T-Shirts on display – which is odd, because I like a bit of Ver Maiden myself. So I might well dig out my faded ‘Seventh Son Of A Seventh Son’ T-shirt and head down to the Discworld Wincanton weekend in December to attempt a bit of reconciliation. The Discworld convention also provided me with a story that currently holds the Wiffle Lever record for encouraging friends to prod me in the ribs and say ‘admit it – you made that bit up, didn’t you?’. In the Discworld chapter, we meet a lovely man called Dave and his even lovelier wife Ali. Dave is a strapping bull of a man who – at conventions – dresses up in size eleven heels and a Penelope Keith hairpiece and becomes, brilliantly, his glamorous alter ego Davina Dress. Yes, that’s right – Dave in a dress.